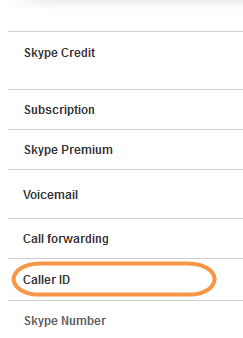 This FAQ contains instructions on how to set up Caller ID, change Caller ID and disable Caller ID for members of your Skype Manager. View the details of the member you wish to assign a Skype Number as the Caller ID. The quickest way to view or modify a member's details is to use the Search members tool in the top right corner of Skype Manager. Simply enter the member's name and a list of matching members will appear below. Click the member you are looking for to view that member's details. In the menu on the left, click Features to display the Member’s features page. Click Set up Caller ID to display the options for setting up Caller ID. Select the Skype Number you wish to assign as the member's Caller ID from the drop-down list. If the selected member does not have a Skype Number, click Buy a Skype Number and follow the on-screen instructions to purchase a new Skype Number. The Skype Number will be set up as the member’s Caller ID after the purchase has been completed. Learn more about the list of countries in which Skype Numbers can be used as Caller ID. Use the Search members tool in the top right corner of Skype Manager to find and select the member whose Caller ID you want to change. Click anywhere in the Caller ID row to display the options for changing the Caller ID settings. Select the new Skype Number you wish to assign as the member's Caller ID from the drop-down list. Use the Search members tool in the top right corner of Skype Manager to find and select the member whose Caller ID you want to disable. Click anywhere in the Caller ID row.